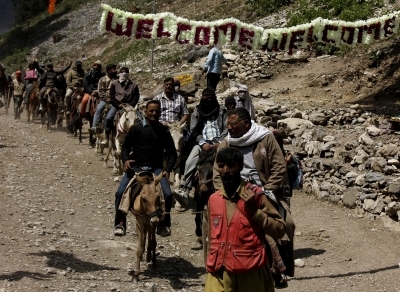 Jammu July 13 (IANS) A fresh batch of 3 451 pilgrims on Friday left Jammu to perform the Amarnath Yatra. They left the Bhagwati Nagar Yatri Niwas in an escorted convoy of 110 vehicles and headed to the Baltal and Pahalgam base camps police said. Jammu and Kashmir Governor N.N.Vohra who heads the Shri Amarnathji Shrine Board (SASB) that manages the pilgrimage has sanctioned a cash relief of Rs 3 lakh each for the next of kin of all pilgrims who might die in accidents during this year s Yatra. Five pilgrims have died in a shooting stone accident in Brarimarg-Railpathri area of Baltal trek while three have died in road accidents so far since the annual pilgrimage began on June 28. It will end of August 26 coinciding with the Shravan Purnima festival.